Happy New Year! To welcome in 2018, I'm doing what I promised to do at the end of Farewell to 2017 from YouTube, Google, and Vox. I begin with the drum corps, in this case, the Marine Drum and Bugle Corps known as "The Commandant's Own," which is marching down Colorado Boulevard for the first time and didn't participate in Bandfest, so I don't have any footage of them in previous parades or performing their field show before the parade. Nor do I have a video of them at this year's Drum Corps International (DCI) Championship. However, I do have a video of them performing three months later in the same stadium at the Bands of America (BOA) Grand Nationals. Just for fun, here's the Marine Corps Drums at WGI 2017 putting on a winter drum line show. Not only was that a great show, it looks like it was good for recruiting, too! Follow over the jump for videos of Kyoto Tachibana Senior High School, B.O.S.S. - Bands of Santiago Sharks, and other bands participating in the Rose Parade that drum corps fans might enjoy. Luis of Music213 brings my readers the rest of today's videos. I begin with Kyoto Tachibana High School Green Band - 2018 Pasadena Bandfest, which was just posted yesterday. From Kyoto, Japan The Kyoto Tachibana Senior High School Green Band performing at the 38th Annual Pasadena Tournament of Roses Bandfest on Saturday, December 30, 2017. This phenomenal group will be performing in the 129th Annual Pasadena Tournament of Roses Parade on Monday, January 1, 2018. Just like in 2011, this was the ONLY performing band (from the 2 day festival) that received a full standing ovation from the crowd. Their show was amazing! THANK YOU, Kyoto Tachibana! I agree with Luis, this was amazing. All the Disney and science fictional elements helped. This is the second time the "Orange Devils" of Kyoto Tachibana Senior High School have marched in the Rose Parade. Here is a video of their peformance on New Years Day 2012. From Kyoto, Japan, The Kyoto Tachibana Senior High School Green Band performing in the 123rd Annual Pasadena Tournament of Roses Parade on Monday, January 2nd 2012. This band definitely gets my vote for BEST BAND (excluding the Marine Band) of this year's Rose Parade. I expect they'll be as big a hit this year. Next, the other marching band that I showed playing "Thriller" before Halloween, Santiago HS Sharks Marching Band - 2017 Pasadena Bandfest. From Corona, CA Santiago High School Sharks Marching Band (B.O.S.S. - Bands of Santiago Sharks) performing their musical selections at the 38th Annual Pasadena Tournament of Roses Bandfest at Pasadena City College on Friday, December 29, 2017. The BOSS will make their second appearance at the Pasadena Tournament of Roses Parade on Monday, January 1, 2018. Their last appearance was in 2013. Congratulations! Here's that 2013 appearance in the Rose Parade. From Corona, CA Santiago High School, The Pride of Santiago, Sharks Marching Band performing their musical selection entitled Tribute to America at the 124th Annual Pasadena Tournament of Roses Parade on Tuesday, January 1st 2013. This is Santiago's first Rose Parade appearance, having secured a spot in this prestigious event after earning the Los Angeles County Fair Marching Band Competition Grand Champion title in October 2011. I don't think they'll be playing the patriotic medley going into the 1812 Overture (itself patriotic, just for another country). Instead I think they'll be playing a California medley, which they performed while marching down Main Street in Disneyland. Santiago High School, The Pride of Santiago, Sharks Marching Band (B.O.S.S. - Bands of Santiago Sharks) performing their musical selections as they march from Main Street, U.S.A. to Town Center Square at the Disneyland Resort on Wednesday, December 27, 2017. The BOSS will be performing in the 129th Pasadena Tournament of Roses Parade on Monday, January 1, 2018. This will mark their second appearance in this prestigious event, having last appeared in 2013. Now, some other bands drum corps fans might like, beginning with Homestead HS Mighty Mustang Marching Band - 2018 Pasadena Bandfest. Don't be fooled by the rah-rah opener going into a good imitation of the Stanford Band. They perform a first-rate field show. From Cupertino, California Homestead High School Mighty Mustang Marching Band performing their field show at the 38th Annual Pasadena Tournament of Roses Bandfest on Friday, December 29, 2017. Next, a band that was chosen at the BOA Grand Nationals, Ronald Reagan HS Marching Band - 2018 Pasadena Bandfest, which was posted less than an hour before midnight. From San Antonio, Texas Ronald Reagan High School Marching Band performing their field show at the 38th Annual Pasadena Tournament of Roses Bandfest on Saturday, December 30, 2017. Now for a marching band I've featured twice on this blog, first in Entertainment news from campuses on the campaign trail and again in Another one for Narb, UMass Minuteman Marching Band - 2018 Pasadena Bandfest. From Amherst, Massachusetts The University of Massachusetts (UMASS) Minuteman Marching Band performing their musical selections at the 38th Annual Pasadena Tournament of Roses Bandfest on Friday, December 29, 2017. While I have a bit of a sentimental attachment to UMass because I marched in a drum corp from Massachusetts for two summers, the event is also about the schools playing in the Rose Bowl, both the football teams and the marching bands. One of them is The Pride of Oklahoma Marching Band - 2018 Pasadena Bandfest. From Norman, Oklahoma The Pride of Oklahoma, University of Oklahoma (UO) Marching Band performing their musical presentations at the 38th Annual Pasadena Tournament of Roses Bandfest on Saturday, December 30, 2017. Yes, that's a West Side Story show, a staple of drum corps for decades. 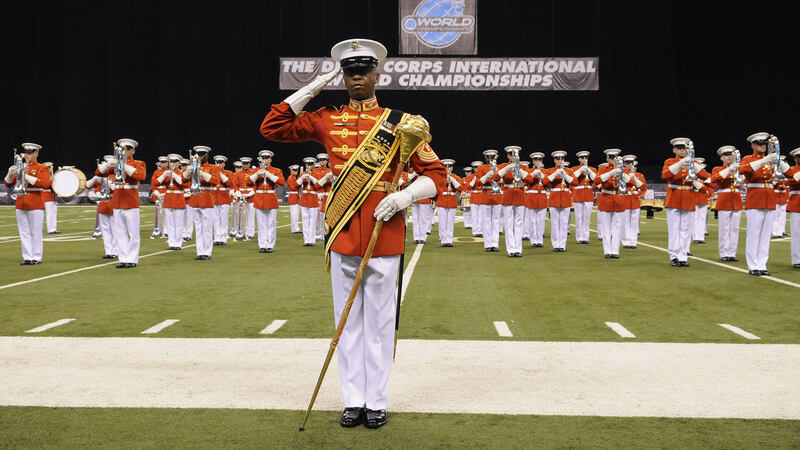 I'm ending this post the way I started it, with a drum corps that will march in the Rose Parade. In this case, it's Pacific Crest, which will march in the 2019 Rose Parade. Here is the corps' 2017 show, "Golden State of Mind". That's next year. This year's parade starts in a few hours. Once again, Happy New Year!